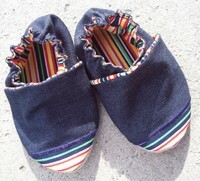 So many people have made these shoes that we’ve had to open a second gallery! 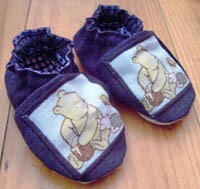 The shoes on these pages were made with Tacky Living’s baby shoe pattern. 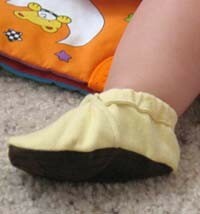 For more information and tips, please also see the baby shoe FAQs. Have you used our pattern? We’d love to see what you did, and other readers would too! Send photos via contact us. 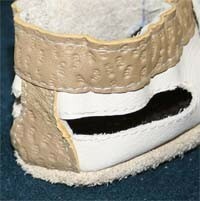 Leather and other non-fraying materials are probably best for this adaptation. Otherwise, one would have to fiddle around with finishing the edges of the ventilation openings. However, it never hurts to experiment – the materials are fairly inexpensive, and that’s how new and clever developments are made. Lynn appears to be something of an expert of sewing with leather. 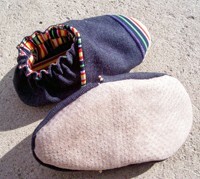 A photo of another pair of equally crisp and professional-looking shoes she made is below. 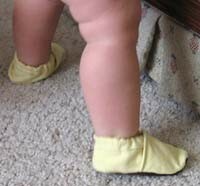 Before we discuss and admire the shoes … just look at those little legs! Is there a more wonderful, perfect substance on this planet than baby skin? Those legs surely must get kissed a lot. yellow linen-blend leftover from making a sling and a baby dress. Marcy’s point about stitching around the vamp before sewing it to the sole is well-taken, and hopefully will save others some frustration. You’d never know it to look at this pair of shoes, but Anita is a beginning sewer. Didn’t she do a great job? 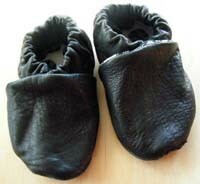 We’d previously heard from Leslie when she made some black leather shoes from recycled leather. This time, she very cleverly gave another type of material a new chance at life. 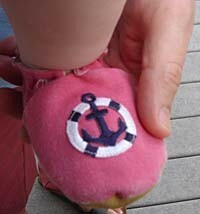 It’s interesting to see that such a strong design element can be made with french knots. Leslie’s ingenious use of recycled materials is also a pleasure to behold. Lynn created the crisp, clean, beautifully professional-looking shoes at left. Notice the contrasting strip she added to the top of the vamp, which adds an interesting design flourish. 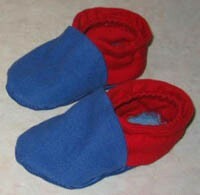 Thanks to her, her grandson will surely have no lack of elegant footwear. Judging by the beautiful shoes she made, if she makes a hundred pairs, there will be a hundred or so very lucky little feet. Actually, the bow coming off one shoe is serendipitous for us, since it lets us compare what the shoe looks like with it versus without. When it’s on, it gives the shoes a bootie-like feeling that is just right. 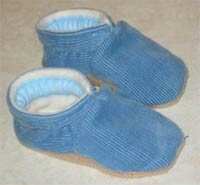 When it’s off, we can see that these shoes would work well for either a little boy or a girl. Good work, Jaime! 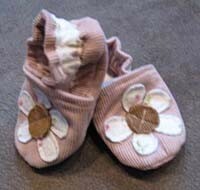 Leslie’s contribution to the gallery are some crisp, professional-looking shoes that would look nice with both casual outfits and when dressing one’s child up a bit. 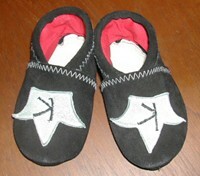 “I recently used your pattern to make my son some soft leather shoes. 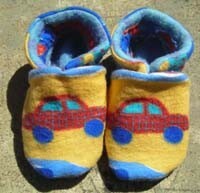 With this bright, playful fabric, the slippers are sure to be a hit with almost any two-year-old! 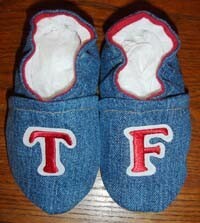 “They are 100 % cotton, which I have found hard to find in store-bought slippers these days! 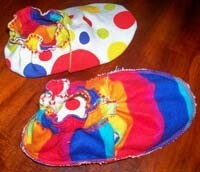 The spotty outer fabric is thicker than the rainbow-coloured lining which can be seen in the second photo where I have turned one slipper out to show you. I love these fabrics because they are bright and fun. 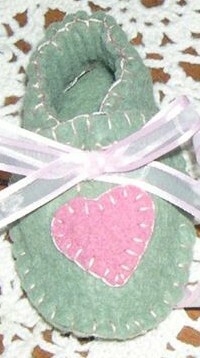 This time I did not use the rubber-type non-slip fabric for the sole as I have previously (the reason being that this pair are slippers and will only be worn inside, mostly on carpeted floor.) 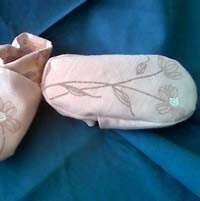 The sole is simply the same as the spotted outer fabric. On the back of the slipper at the top I used some decoration of some star stitching in red cotton as I felt any more than this would have just been too ‘busy’. 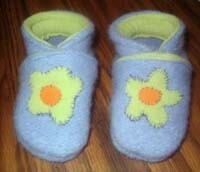 Barbara made these cuddly soft slipper-like shoes from a piece of stretch suede. 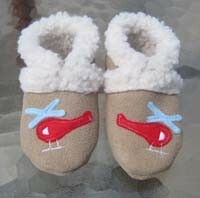 We anticipate that her child is going to have very happy toes! 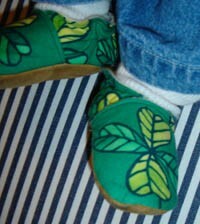 “My 3yo has a collection of Moss Feet shoes (love them but I don’t think she’s in business anymore). Since my 1yo is baby #4 I didn’t think I would be able to swing a different pair of shoes for every day of the week, until now – hooray! A keepsake indeed, and probably one of the nicest ones a person could be kicked with! We admire the way Kara used a color which isn’t traditionally associated with little girls, brown, yet created a feminine-looking shoe. No one would guess that she’s new to sewing. 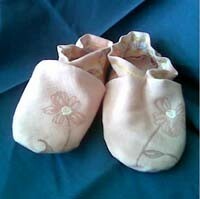 The soft texture and colors of these shoes say “baby”! Didn’t she do a great job? 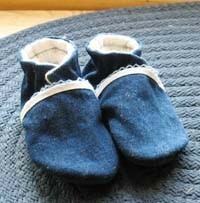 “I just wanted to share a photo of the first pair I have made. 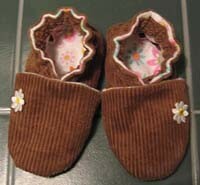 These look soft and comfortable, and we highly approve of the use of materials that might otherwise go to waste. 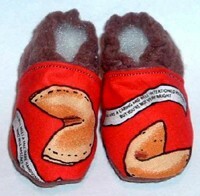 They look wonderful, warm and cozy. Great job, Erica! At left, from top to bottom, we have custom made slippers featuring ladybug appliques, shoes custom made for a friend’s birthday, and a very special pair of shoes celebrating Father’s Day at the yacht club. 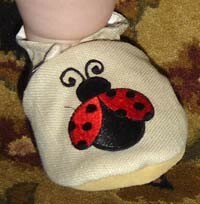 The ladybug and nautical shoes include a glimpse of the most perfect substance on earth, baby skin. 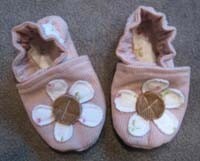 Daniella’s shoes feature corduroy soles, which may be a nice alternative to leather for non-walking children of vegetarians. While standing in line can be tedious, it sounds as though Daniella made good use of her time! Cute and cheap – we like that! We’re very glad that you enjoyed it, Sirorat! “I got the stripey fabric very cheaply (only AUS$1 per metre!). 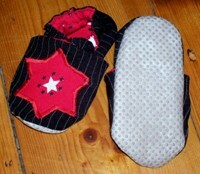 I have again used the non-slip rubber, dotted soles. These look perfect for a summer’s day or a good run along the beach; we can understand why Roy is kicking his heels up in joy! Fiona’s use of a cookie cutter to design an applique is very clever. 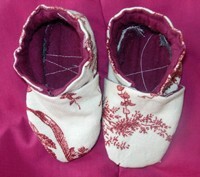 Her shoes also include another special touch, the use of non-slip fabric on the soles. This is a nice alternative for shoes that aren’t going to get heavy wear, or for those who would simply prefer to not to use leather. 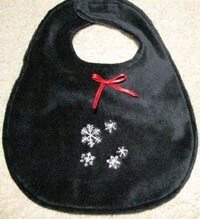 This lovingly embroidered matching shoe and bib set was made by Marna Balazer to coordinate with her granddaughter’s red and black velvet Christmas outfit. 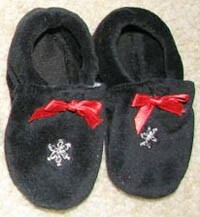 The combination of bows, embroidery and velvet gives these shoes a classic, somewhat formal look. This is a good example of how materials and embellishments can be used to achieve different effects. 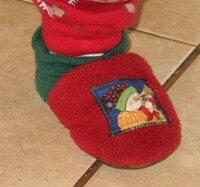 Uppers were made from an old apron salvaged from the garage, decorated with colorful flannel appliques. 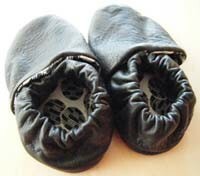 Leather for the soles was bought on sale at a local crafts store. 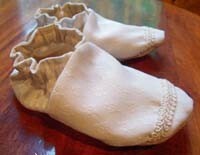 Solveig’s first pair of shoes, shown at left, were made from old clothing. This is a clever way to recycle materials and test the pattern before investing money. 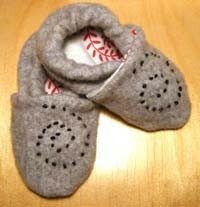 These cheerful, cozy-looking shoes were created by reader Michelle Guilmet for her baby boy. Michelle’s use of fabric is clever, providing a good example of how the same basic pattern can yield radically different looks. 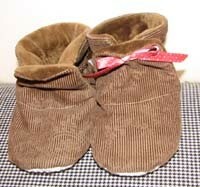 Any child would feel cherished wearing the snuggly corduroy and microfleece shoes at left, while the contrasting vamps and backs of the pair below give them an especially playful look. She made many improvements to our construction methods, including using packaged fleece bias tape for the casing. This simplifies the tedious step of creating the casing. She also placed her casing on the insides of the shoes, which gives them a more polished appearance than when they’re on the outside. 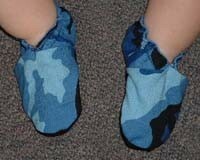 Her shoes are lined with microfleece, which is soft and comfortable when her son goes without socks. 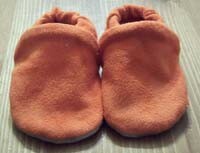 Finally, since her son is not walking yet, it wasn’t necessary to sole the shoes with leather; scraps of corduroy were used instead. 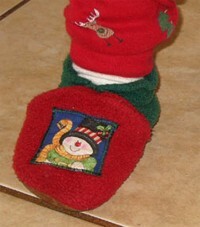 Yet another example of Michelle’s clever use of fabric, modeled by her young son.